Today I’m struggling with embracing the mess in my life so I thought it was the perfect day to write about how beautiful it all is. At least, I’m trying to convince myself of that. I like a good challenge and I am definitely sweating the small stuff. And I thought I was winning and reveled in that smug sort of way I just KNOW those Pinterest-posting people feel. I felt, for about 3 days that I was one of them. It’s impressive, right? Okay, so I didn’t actually use the leveler nor did I drill holes into the wall or hang the wire. I could do all that if I wanted, but someone else around here loves levelers more than I do so I sacrificed my opportunity to bring joy to this man that I love. After the 3rd day, the other MILLION works of art proved to me that I was not Pinterest-worthy because what do you do with the rest of it?! I’m not one of them. The Pinterest-posting folks are still on my pedestal and I’m not on it with them. Oh – and please don’t notice that those masterpieces have been up there for 2 years now. I’m still searching for beautiful in the mess. Still sweating the small stuff. I’m also feeling a little miffed that I came home and spent an hour planning and cooking what I consider to be a nutritious, delicious, veggie-packed, made-from-scratch, natural, mostly organic and definitely no high-fructose corn syrup nor Blue no. 7 nor Red no. 40 meal only to have it all negated by a giant-sized cookie packed with an entire bag of M&Ms – and the kids tell me that Daddy is so nice because he sits and watches TV with them (I was cooking, remember) and also lets them eat the stuff they like to eat (said cookie containing a bag of M&Ms each). Seriously, we should have a rule about this. The rule should be that you can only destroy what you built. I think they have this rule in Kaya’s pre-K class. It’s not fair to be the one putting time and effort into the good-FOR-you stuff and also be the unfun parent. I was quite hurt. When the dinner was all ready, they were not excited enough to come eat. They requested longer in front of the TV (with Daddy). Then, when they finally came to the table, they looked suspiciously at their plates and poked at the few beets I placed on their plates – just to try – don’t judge me. THEN they argued over whose plate belonged to whom, i.e. the plate that looked like it had the fewest veggies was most wanted. Then there was crying. Well, I did take away a plate and muttered something about the food not needing to be eaten because there were other kids in the world who would appreciate even a bite of what was on the plate. No need to force anyone to eat this great meal was my rationale. So the crying was sort of expected. Still, don’t judge me. And I was still searching for the beautiful in the mess and still sweating the small stuff. So then I left the house in the hopes of getting some retail therapy. Retail therapy is real. You can’t convince me otherwise. I drove all the way to the closest mall, enjoying the first quiet moment in my day. And then when I got there and opened my door to get out of the car, I shut it again quickly because it was way too cold and windy to step out of my car and walk in for my therapy session. So I drove back home thinking about it all and wondering how to stop sweating the small stuff and how to truly live out all the beautiful quotes and stories and messages I have received from the universe my entire life through the Glennons and Oprahs and Freires and Brenes and Mayas and many, many self-help and spiritual books. The truth is I know so much more than I live out in my everyday life. I could stop reading all of that and know all that has ever been written and all that will ever be written about truth because it’s all inside me and it’s also all inside you. I know it and you know it when we come across it because we recognize it. Living out these truths is my quest in life. It’s my journey. It’s our journey. And I realized another truth and that is that there will only be one time in my life when I will have arrived at that place of perfection and it will be when I take my last breath. Until then, I must keep at it. The mess will always be there whether physically or emotionally or socially or mentally. The mess is part of life and if we didn’t have it, we would never see the beautiful that exists in it all. Do you see it? There, in middle, but not entirely hidden was a See Beautiful sticker from a remarkable woman and friend who started a movement to get the world to See Beautiful. If you haven’t come across her website or blog or Facebook page, you must. She has encouraged and challenged and pointed out the beautiful in this world at all the right times and in the best ways and sometimes when she doesn’t even know it, e.g. 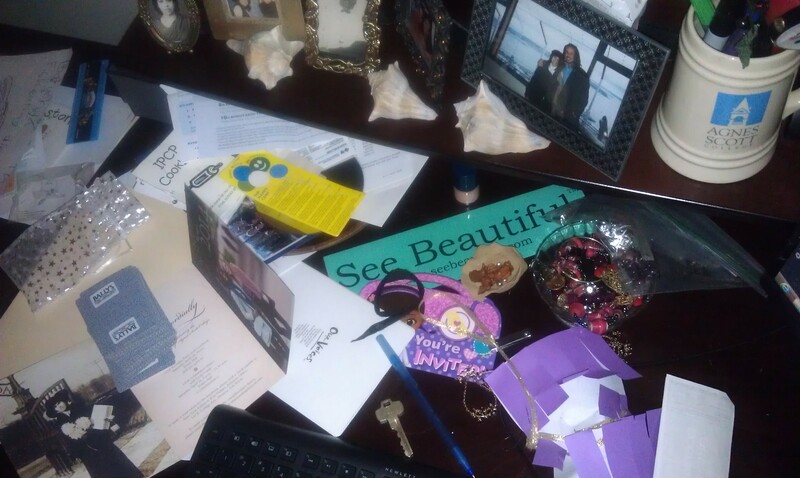 the sticker showing up at the bottom of my messy desk on a day that I was struggling to see beautiful in my messy life. See Beautiful is all about spreading beautiful through messages, projects and sales in the same way that Monkees do. And since I’m writing this post as part of the Messy, Beautiful Warrior Project by Glennon Melton of Momastery (one of my favorite blogs), it seems appropriate to spread the word about the See Beautiful movement. I’ve stopped sweating the small stuff for now (as in just for today until my slightly neurotic PMSy self returns). And I can see my messy, beautiful life again. To learn more about the Messy, Beautiful Warrior Project and join us, CLICK HERE! And to learn about the New York Times Bestselling Memoir Carry On Warrior: The Power of Embracing Your Messy, Beautiful Life, just released in paperback, CLICK HERE! Some days it really is so hard to see through the mess. This post was simply one of the many times I struggled through the lesson. Thanks for reading and commenting! Wow Rhina this was awesome. I have four kids and I live what you have written every day. I get so frustrated with the mess and having to clean up all the time. Also with the dinner fights. This article has made me realize that I should cherish the time I have with their kids as they grow up very quickly. My baby turned 2 today. Thanks for this Rhina. Rina – you are awesome for raising 4 kids. Period. Cherish all the times – the good, the bad, and the extremely messy and be good to yourself often. My truth? I sit here with tears in my eyes because, truth is, I don’t always see beautiful and your post helped me do it today. It IS hard to always see beautiful. It DOES seem pie-in-the-sky-ish at times, but in unique or unexpected or really, really tough times, it does seem to find its way back to my heart and I do take great solace in this lifestyle of seeing beautiful. It’s always there, even in the messy. Thank you, Rhina! Sweet, beautiful friend. I can only imagine that this is a really hard time to see beautiful. The thing is, Lydia, you ARE beautiful and whether you are able to see it every single minute of your life doesn’t always matter. The rest of us will see it for you while you do what you have to do to get through the hard stuff. Know that love is holding you up, friend.